Every summer in Kenya zebras and wildebeest are forced to reluctantly cross the Mara River to follow the rains and green grasses sprouting the Serengeti plains of Tanzania. This is the world's largest wildlife migration, with tens of thousands of animals moving en masse. But crossing the river is an insurmountable obstacle for many as they are trampled or taken by the crocodiles that patiently wait along the river banks. We will witness this amazing cycle of life, which will remind us of the natural rhythms of Africa that have been repeated for centuries. This African safari will begin in Nairobi and quickly move to Lake Nakuru, a smaller park where white and black rhinoceroses are being bred to re-populate the population that has been greatly impacted by poaching. We will then move to Sweetwaters, a private preserve with abundant wildlife, before driving north to the Samburu region. The Samburu are a proud and colorful tribe, similar to the Maasai who live further to the south. 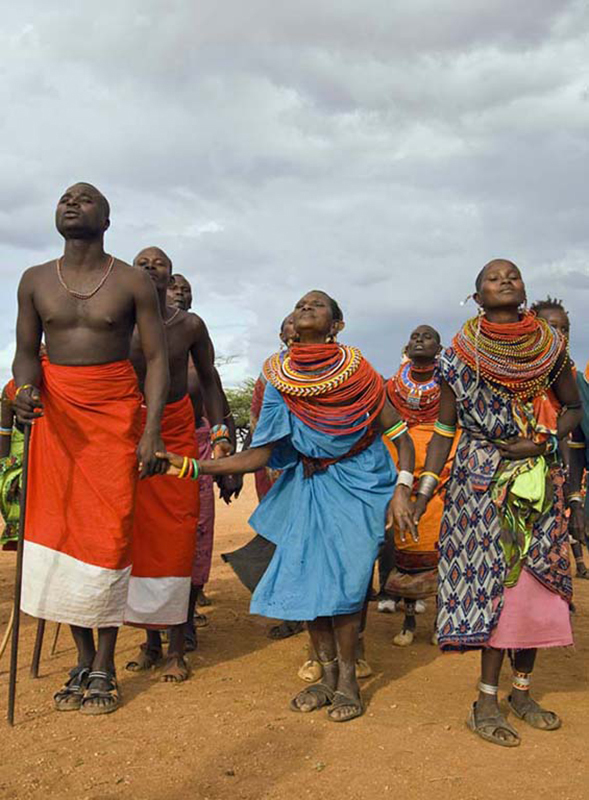 We will have opportunities to visit a Samburu village to observe a dance. We will then return to Nairobi and visit the Giraffe Center and Daphne Sheldrick Elephant Orphanage. This orphanage raises young elephants whose mothers have been killed by poachers and prepares them for a return to their natural habitat. The following day we will fly to the Maasai Mara Game Preserve in western Kenya where we will have numerous game drives as we search for lions, leopards, rhinoceroses, elephants and every animal that lives in this large national park. September is a dry month in Kenya, which means the grasses will be low and wildlife easier to find. This safari will truly be the experience of a lifetime, you will return a changed person. "I have enjoyed four wonderful photography adventures led by Douglas Steakley: Yellowstone In Winter, Burma, Iceland, and a safari to Botswana and Victoria Falls. Upon arrival you will be met at the airport and transferred to the luxurious and historic Norfolk Hotel. The Norfolk was built in the grand British tradition and features spacious rooms, open grounds with a swimming pool and a bar where you will hear languages spoken from around the world. After breakfast we will have a brief orientation before being picked up by our drivers for the short trip to Lake Nakuru. 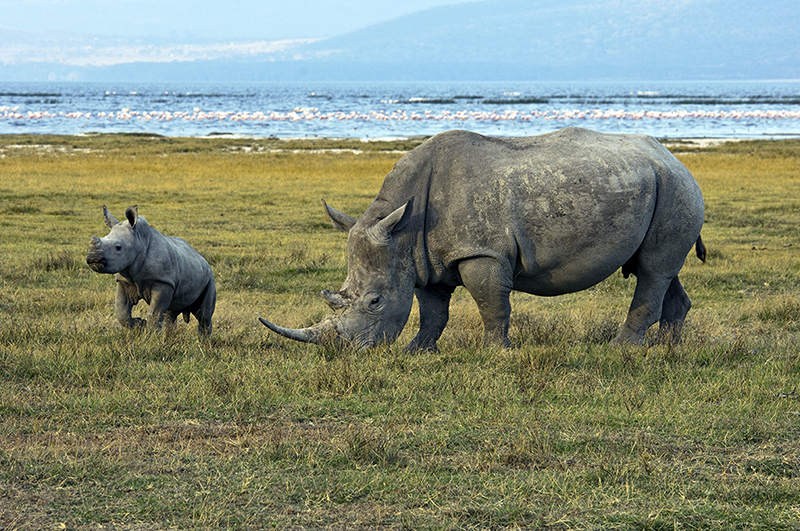 One of the highlights of visiting Lake Nakuru is being able to see white rhinoceroses close up. They have been re-introduced to this area and a breeding program is now in place so we often see mothers and babies. There are also populations of lions, which sometimes sleep in the trees, leopards and giraffe as well as numerous birds. We will arrive at the lodge for lunch, check into our rooms and have an afternoon game drive. We will have an early morning game drive at Lake Nakuru, return for breakfast and move to Sweetwaters Tented Camp. We will arrive in time to check into our rooms and have an afternoon game drive. Sweetwaters is a private camp and has a very high wildlife population. It is part of the Serena Hotel chain and considered one of the best tented camps in Kenya. The Waterhole Bar, built in the style of a game-viewing hide, overlooks a watering hole and offers spectacular wildlife watching as the animals come in to drink. Sweetwaters is also the largest black rhino sanctuary in East Africa and shelters a large number of other rare and endangered species. After an early morning game drive and breakfast at Sweetwaters, we will transfer north to the Elephant Bedroom Camp in the Samburu region. Elephant Bedroom Camp offers luxury in a setting of breath taking beauty. It is set along the banks of the Ewaso Nyiro River and shaded by palms and other trees that make up this green belt of riverside forest. The surrounding Samburu National Reserve is an area of spectacular scenery; its dry plains bisected by the meandering river, with the backdrop of Africa's dramatic mountains, including Mt Kenya. Elephant Tented Camp is a small, intimate camp with only twelve spacious tents featuring rustic and colorful African touches. These luxury tents offer all amenities, including a private plunge pool on the deck, and hot and cold running water, shower, and electricity. The lounge and dining area is decorated in a vibrant safari style and the soft intimate lighting assures that this is the ultimate place to relax between exciting game drives. Elephant, monkeys, and impalas are among the camp's many regular visitors, while Samburu National Reserve also has a good number of lions and leopards. The hot dry climate is also perfect for al-fresco breakfasts and relaxed lunches. In the evening, candle-lit dinners can be enjoyed in the cozy dining area under the magnificent African sky. During our stay we will have both early morning and afternoon game drives as well as a visit to a local Samburu village. The Samburu are a colorful tribe, both men and women paint their faces and their dances are very expressive. We will have two full days to relax and enjoy early morning and evening game drives while in the Samburu region of northern Kenya. During the afternoons we can take a dip in the pool or relax on the deck overlooking the watering hole. The lodge also offers guided nature walks in the bush, wi-fi in the lounge, spa services and lectures on the Samburu by the resident naturalist. The days will easily flow into one another and we will have continuing adventure stories to share about our wildlife viewing experiences. After breakfast we will meet our drivers for the trip back to Nairobi with lunch en route. We will arrive in the afternoon and check back into the Norfolk Hotel. In the morning we will visit the Giraffe Center and the Daphne Sheldrick Elephant Sanctuary. The Sheldrick Elephant Sanctuary rescues baby elephants whose mothers have been killed by poachers. Each elephant is assigned a caretaker who is with them day and night. They sleep in buildings that are on the property and form a strong emotional bond. During our visit the baby elephants will be very close to us as they are fed milk in large bottles and play with each other in a large pen. After our visit we will have lunch at a nearby outdoor restaurant and then transfer to the domestic airport for our bush flight to the Massai Mara Game Reserve. We will check into our rooms and have an afternoon game drive--our first in the Maasai Mara. The Mara Bush Camp is a small mobile camp that follows the migration. There are only 12 luxurious riverfront tents as well as a dining tent and a comfortable lounge tent. These smaller, portable camps provide an experience in Africa that feels more "authentic" than staying in the larger lodges with permanent buildings. There are no fences around our camp so we will be looked after by Maasai warriors in the night and they will accompany us from the dining tent to our personal tents after dinner. In a similar camp in the past I have had buffalo eating grasses outside my tent at night. Our tents are spacious and each one has a private bathroom with toilet, sink, running water and a hot shower. The beds have mosquito netting and comfortable furniture. Early morning coffee or tea can be served on your private veranda in the morning and the lounge tent is located near the Olare Orok, which is home to a group of hippos. Imagine enjoying a sundowner while observing these large mammals. Meals are prepared by the camp's chef and box lunches are available in case we decide to stay out all day on an extended safari drive. This will be a memorable experience of Africa that you will cherish for years. During one of the afternoons we will visit a Maasai Village where they will tell us about their way of life and the men will dance (jump) for us. We will have both early morning and afternoon game drives each day and the option of an all day game drive with box lunches. After our early morning game drive and breakfast at the Mara Bush Camp, our drivers will transfer us to the Mara Serena Lodge, which is located at the center of the Maasai Mara National Reserve. This lodge allows easy access to the "greatest wildlife show on earth"--the annual migration of wildebeests as they cross the Mara River. Each room stands alone with sweeping, uninterrupted views of the Mara River, private balconies, spacious seating areas and are decorated in graphic African designs. Hot air balloon trips are available at dawn from this location, which provide a spectacular overview from a low altitude of the savannah, river and wildlife below. We will have early morning and afternoon game drives every day and have ample time to relax by the pool or take advantage of the new spa and gym. We will have an early morning game drive, our last of the safari. Following breakfast we will check out of our rooms and be taken to the local airstrip by our drivers for the return flight to Nairobi. We will be picked up and taken to the beautiful Ole Sereni Hotel, which is located near the airport where we will have a farewell dinner and day rooms. The Ole Sereni has an outdoor pool and spa where you can relax during the afternoon. After dinner we will transfer to the international airport for our evening flights home. Mu safaris to Africa are arranged by Best Safaris, who have an office in southern California. I have worked with the excellent staff at Best Safaris for many years planning numerous safaris to Africa. Prem Sharma and Gaby Gurrola are our contact people and they work hard to insure that our expeditions are comfortable, convenient and place us in the best locations at the best times. We realize that for many, an African safari truly is the “trip of a lifetime” and we strive to make your tour as interesting and memorable as possible. We have selected superb lodges in different types of locations from water front to savannah and also those which provide the upscale amenities that make everyone feel secure and welcome. Best Safaris is registered travel agent who will also assist us with booking international flights that are convenient and affordable. Please call 800-757-6625 and ask for Prem or Gaby. Best Safaris can also arrange extensions to other locations in East or South Africa. The cost for the safari is $11,340.00 per person, double occupancy. A single supplement is $1710.00. A non-refundable deposit of $1000.00 is required with registration. For trip insurance please contact www.travelguard.com/bestsafaris. All transportation in extended comfortable safari Toyota Land Cruisers with only three passengers per vehicle. Gratuities--plan on about $200.00 per person. While this safari is designed for photographers, non-photographers are welcome and encouraged. My experience in Africa has been that almost everyone wants to return with stunning images and improve their photographic skills. I will be available to assist with questions about photography at all levels from beginners to advanced. I have found that everyone's photographs improve as the trip progresses. ~We get up early in the morning to photograph the animals while they are very active and to see dramatic sunrises. Early morning not only offers the best light, but many animals lay down to sleep as soon as the sun rises. Dawn is a magic time to be out and about in Africa! We have tea and coffee before departing and return for breakfast around 9:00 am. ~We spend more time when photo opportunities present themselves. It is not unusual for us to spend an hour or so tracking a pride of lions or a cheetah hunting, waiting and taking advantage of these opportunities. Hanging around allows the animals to become accustomed to our presence as they go about their activities and is often very rewarding in unexpected ways. "Doug’s organizing this trip made it run very smoothly. I was never intimated by my lack of photographic experience, rather I was so comfortable with him and the group, that I improved beyond anything I could have hoped for--my point and shoot was well respected !! The best part about going on a photo trip is that the energy is focused on seeing the animals at the best time of day, having vehicles specially set up for photographers — rather than being jammed into jeeps as we saw with other safari groups. My two week photography safari in Kenya and Tanzania trip was amazing from start to finish. Doug had led trips to Africa on many occasions and the locations were carefully selected for the best wildlife viewing while staying in upscale accommodations and enjoying excellent cuisine. Our guides were friendly and very knowledgeable about the wildlife and the great variety of birds in East Africa. Safari vehicles shared by 3 people guaranteed everyone had access to the best viewing and images. Workshops and individual coaching by Doug helped all of us improve our shooting techniques and image processing. Some of the highlights included large herds of elephants in Amboselli National Park, tree- climbing lions in Tanzania, hundreds of flamingos in Lake Ndutu, and thousands of wildebeest and zebras forming part of the Great Migration in the Serengeti. Each day brought new wonders and many memorable images for our group. A big “thumbs up” to Doug for leading this incredible trip. passing within feet of our jeep, completely unfazed by our presence as they make their way back into the bush. This experience was within the first half hour of our initial game drive, put together and led by Professional Photographer Doug Steakley and each outing afterwards managed to surpass the last! Nothing prepares you for the vastness of the Serengeti Plains with the multitude of Zebras and Wildebeest to forging a trail, on foot, through the Rwanda jungle and suddenly finding yourselves in the midst of a family of mountain gorillas! Doug made every aspect of the trip seem effortless, from knowing the best times to photograph the animals, assuring that each jeep held only three people so everyone had a panoramic view, to answering all of our photography questions with infinite calm and great patience. Even those of us “non photographers” were hooked! "I have enjoyed four wonderful photography adventures led by Douglas Steakley: Yellowstone In Winter, Burma, Iceland and a safari to Botswana and Victoria Falls. “Even for a world-traveled career military officer, this was the trip of a lifetime with a small group of congenial folks and choreographed by a fine guide-photographer-teacher. The great migration and the “big five” animals of Kenya and Tanzania have to be seen up close and personal to be really appreciated. And unexpectedly rubbing backs with a 400 pound silverback gorilla in Rwanda was an exciting bonus." "Doug, I have been reliving Botswana and Zambia via reviewing and editing my photos and I remain convinced that this trip or expedition or adventure with you will be the most excellent such experience of my life, until perhaps we do it again. Thanks again for laying out an amazing itinerary and for your guidance and companionship on this trip. Hello to Jackie and may we travel again sometime." "Great trip which combined seeing thousands of animals up close which was definitely on my "bucket list". Having an opportunity to spend a couple of weeks with other people who shared my interest and enthusiasm for photography was fabulous. Doug took the time to teach me how to utilize my Nikon D800 to its full capacity. Great experience. Lasting friendships..."
Lying in our tent in the Ndutu region of the Serengeti, listening to lions and elephants roar, and experiencing a Cape buffalo munching grass three feet from my head, I knew then that it was the best night of my life! Seriously! To spend 23 days on the most wonderful adventure and photographic experience of my life will stay with me forever. Our journey to Kenya, Tanzania and Rwanda with photographer Doug Steakley was such an incredible and memorable event. After a stop in Amsterdam (where Doug taught us night photography techniques), we made our way to Africa. This was a total immersion in wildlife, culture and photography all in one place with the best instructor one could obtain. Doug is patient, helpful, and informative with his extensive knowledge of both photography and each of our destinations. His trips are first class, from the vehicles he uses, (with plenty of room for all our camera equipment), to the lodges and knowledgeable guides he hires. "I was fortunate enough to go on the Rwanda leg of this excursion. It was a remarkable place and so much more than I envisioned. The landscape, culture and history are vastly different from Kenya and Tanzania. Trekking to see the Mountain gorillas was exhilarating and magical. Doug arranges everything and takes care of all the small details. I felt pampered on the entire trip. As a woman traveling without my husband, I felt very safe and well cared for wherever we went. You cannot go wrong booking a photography venture with Doug. I feel so blessed to have had this opportunity and know I’ll be joining him on future journeys." 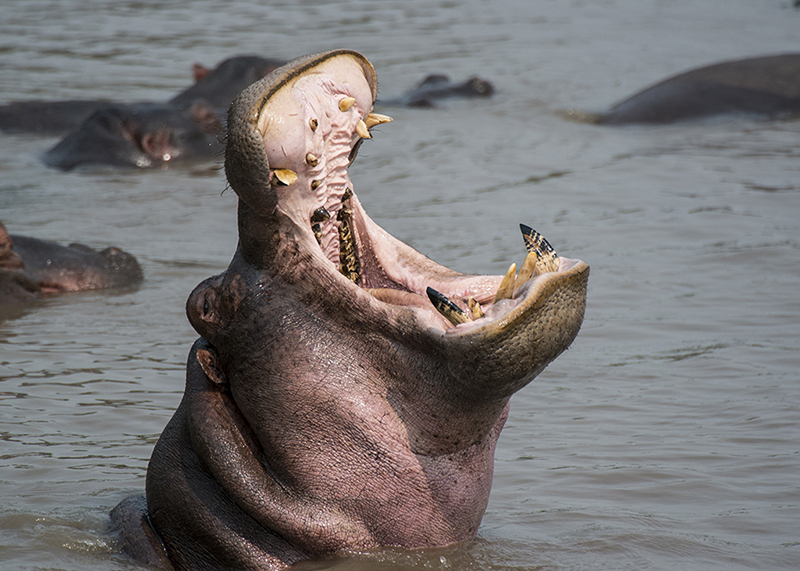 "I’ve just returned from an African safari with Doug Steakley and have only one word: WOW! Wow to the diversity of wildlife, wow to the accommodations, wow to the service, wow to the guides/drivers. And a big wow to Doug. Thanks to Doug, I’m a much better photographer than I was before I left. His appreciation for composition, knowledge of camera settings and his willingness to share his love of photography with us all is a big reason for the grin that stretches across my face. Thank you, Doug." "My two week photography safari in Kenya and Tanzania trip was amazing from start to finish. Doug had led trips to Africa on many occasions and the locations were carefully selected for the best wildlife viewing while staying in upscale accommodations and enjoying excellent cuisine. Our guides were friendly and very knowledgeable about the wildlife and the great variety of birds in East Africa. Safari vehicles shared by 3 people guaranteed everyone had access to the best viewing and images. Workshops and individual coaching by Doug helped all of us improve our shooting techniques and image processing. Some of the highlights included large herds of elephants in Amboseli National Park, tree- climbing lions in Tanzania, hundreds of flamingos in Lake Ndutu, and thousands of wildebeest and zebras forming part of the Great Migration in the Serengeti. Each day brought new wonders and many memorable images for our group.A big “thumbs up” to Doug for leading this incredible trip." "Thank you so much for putting together such an outstanding visit to the gorillas of Rwanda!! You put a lot of thought and planning into making the trip as perfect as possible: from answering my many pre-trip questions to selecting Mountain Gorilla View Lodge because of its location to asking for François and Edward to pointing out the airport cafés, etc., etc., etc. I had a wonderful time! Sure, the power went out at inconvenient times and I was glad that I had my portable pharmacy ... but that's all part of the Africa experience. My time in Nairobi with the elephant orphans was very special and moving. The gorillas? They are awesome in the classic definition of the word!! I keep looking at my photos and souvenirs and re-living the phenomenal experience of visiting the gentle giants.Thank you, Doug, for this trip that was a dream come true for me!!!!"